Titled: " MAPPA BRITANNIAE SEPTENTRIONALIS - FACIEI ROMANAE - SECUNDUM FIDEM MONUMENTORUM - PERVETERUM DEPICTA - EX RICARDO CORINENSE - MONCHADO WEST ... " Produced by The Antiquarian Society of London in 1774, and published by Thomas Reynolds in 1793. Engraved by J. Cheevers, Sculpt. A very large Latin map of Classical Scotland, with Northen Ireland, the surrounding islands, and Northern England. 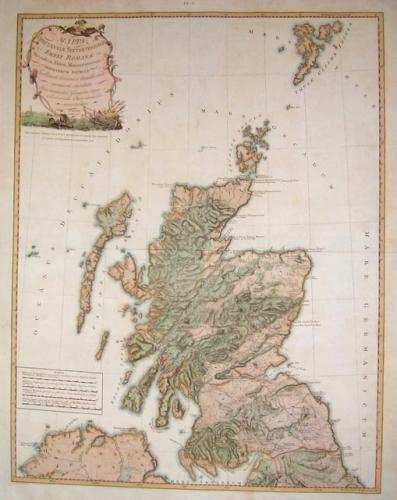 This map is an original from 1793 and is quite beautifully hand coloured in full shades of green, red, tan and blue with the regions of Scotland and the surrounding Scottish Islands also hand colored. There is a quad distance scale and a title cartouche with all manner of Scottish weaponry and swords and shields with a floral scroll frame and Scottish farm. It a large original copper plate map that is blank on the back and is in excellent condition.